Its time for the family reunion at Symphony Hall and the instruments are starting to arrive! Here comes the Brass family what a blast, and the String family always arrives early so they can sit in the front! Look who's marching down the street its the Percussion family, and at last, the Woodwinds have arrived the whole reedy bunch and more! 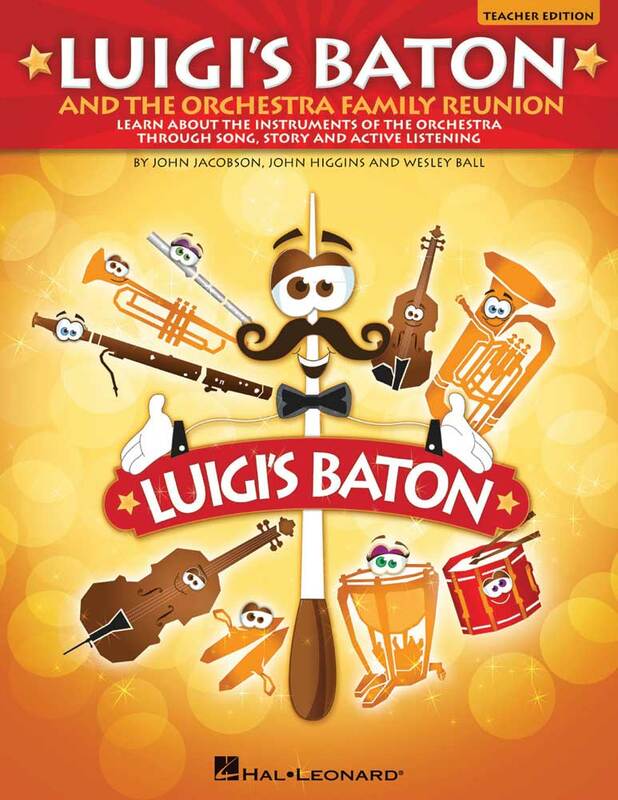 Join Maestro Luigi and his trusted baton for a multi-media study of the instruments of the orchestra like never before! Your students will enjoy humorous story-telling, original songs and listening maps of orchestral recordings that feature each family. A DIGITAL STUDENT edition comes with the Teacher Edition, so everything can be projected from your computer! The enclosed CD-ROM features full-color PDFs of the stories, vocal songsheets, and listening maps all with embedded audio and video recordings so you can listen, watch, sing or dance with a single click! Join John as he shows you the choreography for each song. And theres more click on a picture of each instrument and hear a short sound clip great for review and assessment! The Teacher Edition offers easy-to-present lesson plans linked to the National Standards for all the material and piano/vocal song arrangements with printed choreography notes. This incredible interactive resource is a must for every music library! Songs include: Its a Blast, The Musics in You, Crash! Boom! Bang!, On the Wind, Family Reunion. Orchestral Recordings include: Fanfare for the Common Man, Pizzicato Polka, Percussion and Theme from The Young Persons Guide to the Orchestra, Little Fugue in G minor, Hungarian Dance No. 6. Please select the package options from the right before adding this product to your cart!These products are drop shipped from the publisher and must be ordered separately.